In 2004 I went to Rome for a month’s dissertation research. 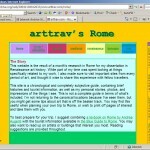 While I was there I kept my notes on a free website hosted by Tripod, called “One Month Rome”. I originally conceived of this website as the guidebook I cannot find. There are some excellent guidebooks out there (see guidebook shopping list! ), but information is not always ordered the way I’d want it. Furthermore, guidebooks and websites only gave me facts about dates and artists, but no interpretation, investigation, or comparison with other works of art or locations. Finally, not all guidebooks have photos, and those that do are often not so heavy on the intellectual information… yet, sometimes you need to see a photo to know if you want to go there. I tried using art history textbooks for their photos and great text, but they lack practical information that the traveler needs. So, I combined basic factual information about things to see in Rome (including opening hours and directions) with photos and university-level analysis. When I returned home to Florence, my husband Tommaso encouraged me to expand my online information to Florence and buy a real domain. He also taught me Macromedia Dreamweaver to build the website. The design limits that you can see in the screenshot are result of what you could do back then. We were never really all that happy with the functionality of this website, nor with the cheesy multicoloured maiolica-inspired colours. 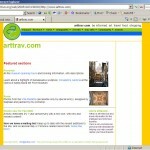 The chosen name, “arttrav”, is a combination of art and travel. It is a homage to the concept of “SlowTravel” (www.slowtrav.com), or staying in one place for a while; itself a counterpart to the concept of “Slow Food” (www.slowfood.com), an important eco-gastronomic movement. We heartily subscribe to both these movements and make frequent use of their internet resources. Summer on the beach in Puglia in 2005… Tommaso was inspired to design a cleaner logo and update arttrav in accordance with some new technologies. Now you could have a moving menu bar! 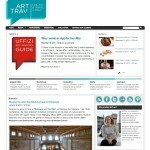 We divided up the topics on the site into “art” and “travel”, and made up other headings, all of which I deeply regret. I think this version of the website was never very navigable. The summer 2008 move to a wordpress format was intended to make material more easily accessible, not only on your screen at home, but also on your iphone or ipod touch. It was easy to convert to this new format, and suddenly I could quickly update the content. Over 2008/9 I wrote a lot of new articles. But any time I showed someone the site, they said “What’s this? Your blog?”. It looked pretty good, but it still wasn’t right. In Spring 2009 we finally found a better solution with a proper magazine theme, Arthemia. In 2012 Marco Badiani from Flod designed the new teal logo. In February 2014 we’ve updated with a strong wordpress theme that I hope better reflects the depth of content – over 600 articles published, and coming up on a 10th birthday!